The vertebral structure on its back that can be adjusted and will slightly bend to ensure comfort to the one who uses it. and will sway to the flow of its back. Very unique chair design. 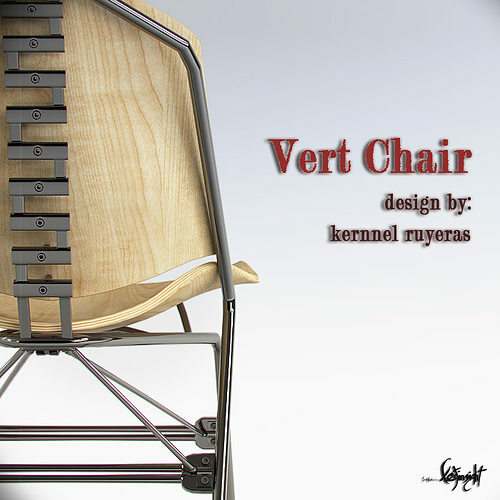 -What's inside: 2 High Quality 3D models of Vert chair and detailed enough for close up renders with HD maps.light 3D models that is ideal for mixing into large files. Polygonal modeling is excellent with small polygon count. Excellent chair design, models are scaled in real world measurements. - With over 7 realistic materials. - Studio scene Set-up are included. - Studio HDRI are not included due to copyright infringement. - Models are layered ready and all the mesh part were named properly. - This model is ready to be imported into your scene. 3D model size: 4.02 MB each. -Available extensions: .max-vray shaders only. "All Lostinsight3D products are created with care and quality." Very nice design :) I like it. cool.. Daintiness stylish! great job!! !